Floated for final fit out at Drydocks World (Nanindah, Indonesia) CSS Derwent is a compact semi-submersible designed and equipped to meet current and anticipated subsea industry demand. With accommodation for up to 152 personnel, she is a multi-service vessel built for complex subsea operations and work scopes that cross a wide spectrum of duties including construction support, IRM and light/medium well intervention. 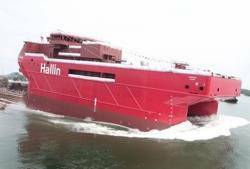 The new ship is built to meet the challenges of safe deck handling with a 160 metric tonne active-heave-compensated guided Modular Handling System and a 150 tonne crane capable of working at water depths of 3,000 metres, supported by dedicated 120 tonne pallet and skidding system. She is fully prepared for subsea construction operations such as the installation of subsea trees, manifolds, flowlines, umbilicals and subsea structures as well as providing support to existing fields with inspection maintenance and repair services. Responding to the huge challenges of deepwater operations, the innovative CSS design delivers exceptionally stable sea-keeping characteristics. A very large zone 1 rated deck (1,300 square metres) and long lay down area ensure good project load carrying capacity and meet the requirementsof potential hydrocarbon management. Classed by ABS as a DP Class 3 Mobile Offshore Drilling Unit (MODU), the CSS Derwent incorporates technology from industry-leading providers such as MacGregor (lifting systems), Rolls Royce (engines and thrusters), Kongsberg (dynamic positioning)and ABB (power management),;maximising safety in operations and minimising cost through fuel-efficient diesel electric propulsion. CSS Derwent will carry two dedicated Quantum XP 225 hp deepwater construction class ROVs cabable of working at 3,000 metres water depth. Designed to undertake the most demanding and power intensive subsea tasks in very deep water; the ROVs are housed below deck together co-located with built-in control rooms and workshops. They can be deployed through a dedicated centreline moonpool or from a starboard side launch position. These ROVs feature the latest technical advancements, including dynamic positioning (ROVDP), advanced diagnostics and the ability to plug and play standard instrumentation and tooling.